The all-new BMW ALPINA B7 xDrive stands for luxury paired with precision dynamics, effortless performance and comfort at the highest level. If you are living in the Milton area and looking for a new vehicle, and this sounds intriguing to you, you should come into Budds’ BMW Oakville. This exclusive automobile is highlighted by a new 4.4 litre 8-cylinder engine with Bi-Turbo charging, gasoline direct injection and Valvetronic. It delivers an impressive output of 600 hp between 5,750 and 6,250 rpm, while the maximum torque of 590 lb-ft is available from 3,000 rpm. The resulting performance figures are remarkable – the new BMW ALPINA B7 xDrive accelerates from 0 to 100 km/h in just 3.7 seconds and is capable of a top speed of 310 km/h. We have included some specifications of the vehicle below. 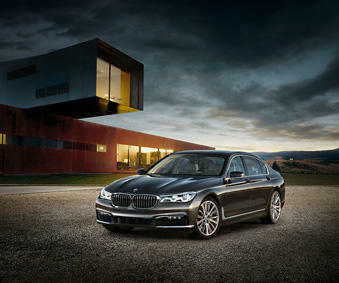 The appearance of the new BMW ALPINA B7 xDrive is defined by athletic flair and elegance. The BMW ALPINA design and aerodynamic elements emphasize its performance character, with the front and rear spoiler striking a harmonious balance and highlighting the powerful presence of the BMW ALPINA B7 xDrive. The design blends form and function – the aerodynamic components reduce uplift on the front and rear axles to almost zero for maximum driving stability at all speeds. Openings at the front of the vehicle allow the precise and effective flow of air to the individual components of the high-performance cooling system. The iconic BMW kidney grille is fitted with an integrated air flap control system that adapts to the BMW ALPINA B7 xDrive cooling needs: when closed it further reduces the level of aerodynamic drag. The new BMW ALPINA B7 xDrive will be available with either 20” or 21” wheels with Michelin Pilot Super Sport tires. The 20” format will consist of 255/40 ZR20 tires at the front and 295/35 ZR20 tires at the rear, mounted on 8.5 x 20 and 10 x 20 BMW ALPINA CLASSIC wheels respectively. New lightweight 21” forged wheels take the traditional 20-spoke BMW ALPINA CLASSIC design in a new minimalistic and technical direction. Forging results in high-density and high-strength aluminum alloy which enables a weight-optimized construction that saves 2.5 kg of unsprung mass per wheel. The stainless-steel BMW ALPINA sports exhaust system is responsible for a reduction in back pressure and weight, its sonorous sound is typically V8. Active exhaust valves allow the driver to influence the sound experience by switching between Comfort and Sport Mode. A typical BMW ALPINA feature: the two twin tailpipes of the exhaust system are integrated elegantly and aesthetically into the rear bumper. If you are looking for a new vehicle in the Milton area with power, technical innovation and attractive design language for an exhilarating and dynamic driving performance, the BMW Alpina B7 could be the driving machine for you. We recommend you come in and see us at Budds’ BMW Oakville to get purchasing advice and a test drive.